Springfield Armory designed the original EMP with an “all-new Patented short action.” Now, the EMP 4 has every innovation made to the series, 17 redesigns later. This mini 1911 is comfortable, concealable, and optimized for the smaller 9mm and .40S&W calibers. Springfield Armory has two versions of their EMP 4—the Champion .40S&W and the Lightweight Champion 9mm. The four-inch barrel of Springfield’s EMP 4 offers an increased sight radius for more practical accuracy and target acquisition. And if you know anything about ballistics, you know that this slightly longer barrel on a compact adds extra velocity for the cartridge. Sitting on that barrel is a fiber optic front sight and two-dot, combat rear sights that are low-profile to prevent snagging but add to the EMP’s target acquisition capabilities. Sitting at five-and-a-half-inches in height, the EMP 4 adds extra room for a strong grip, regardless of hand size. Springfield’s EMP 4s come with ambidextrous safety levers, and Springfield’s Posi-Lok grip texture to the front strap for added grip control. For added safety, the EMPs come with a grip safety, which gives them the classic 1911 feel. The EMP 4s pack ten 9mm rounds or nine .40S&W rounds in a slim, single stack magazine (plus one in the chamber). 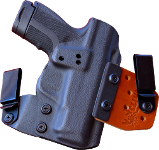 This choice was made by Springfield to decrease the grip circumference for added comfort, concealability, and control.